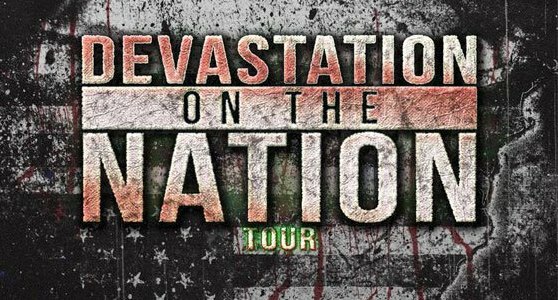 Those who enjoy technical death metal had to be smiling from ear to ear when this year’s edition of Devastation on the Nation was announced. Putting together long-running acts like Cryptopsy and Decrepit Birth with newer, buzz-worthy acts like Rivers of Nihil, The Zenith Passage, and The Kennedy Veil (among even more choice picks) brings a culmination of some of death metal’s finest acts of the moment. 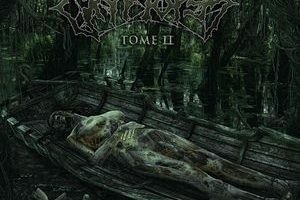 Add in Cryptopsy playing all of None So Vile, and it sweetens the pot even further. Arriving just as local act Calamity finished their set, Troy-based OrganHarvest was the last of the locals before the nationals began. Sporting a number of high-profile players from other previous (Wasteform, Mucopus, Declension) and current local acts (Assault on the Living), it was safe to say there was a lot of experience at hand in the band (who have had an off-again, on-again status). Brutal death metal in the finest of upstate NY traditions was the name of the game in their set, and they played a tight set of nicely balanced groove with fast/heavy moments. Certainly a band to keep an eye on if you are in the area. Up first was that of Washington D.C.’s Gloom, who brought a unique take on death metal along with them. Their debut full-length comes out next week on eOne (June 2), and the band’s set played in service to it. Splicing together bits and pieces of death metal (duh), black metal, progressive elements, and sludge/doom, they may not have been as completely relentless as some of the later bands in the bill, but the sleek melodies (and a few monster riffs) sure made up for it. One of this scribe’s favorites within the extreme realm, The Kennedy Veil, was up next. Showcasing a new vocalist (Monte Barnard) and a new album in October, the band stuck with mostly new material (hitting only “Ad Noctem” from Trinity in Falsehood). But with good reason, as it seemed to spout the same love of massive grooves and hyperspeed found on their debut. But this time with some more added, darker atmosphere to give it an extra punch. Monte seems an excellent pick vocally, with some wicked high screams and plenty of live presence (adding nicely to the rest of the band) – the new album has much promise! Continuing with some technical death metal was The Zenith Passage, whose 2016 Solipsist was one of the strongest in said field. With short sets, the bands focused on newer material, and TZP was no different here, though older cut “Cosmic Dissonance” was a real showstopper. For all of the band’s challenging technical prowess, they had little difficulty pulling it off with energy and enthusiasm live. A real treat to be able to watch guitarist Justin McKinney charge through some solos in particular. It’s been a while since I’ve been able to catch Rivers of Nihil as well, and they were as impressive as the memory recalls. A nice balance of new(ish) cuts from Monarchy, a pair from The Conscious Seed of Light, and even a trip back to their Temporality Unbound EP with “(sin)chronos” was in order. Atmosphere and groove come in full-effect, and the band’s sound got one of the stronger crowd responses of the evening. It’s got to be practically impossible to sit still during the massive groove of “Soil & Seed.” One hopes to hear some new material from the band sooner than later. Never having seen Decrepit Birth, they were easily one of the highlights of the night. They incited the crowd to mosh and participate more than any other, and the crowd showed little difficulty in following along…particularly after vocalist Bill Robinson personally entered the pit and begin pushing people around himself! He later held off new cut “Epigenetic Triplicity” until he was satisfied with the crowd, as well as provided some much needed humor and perspective by this point in the evening (there was 8 death metal acts in a 6.5 hour period afterall). The rest of the band was just as on-point (including The Kennedy Veil’s Gabe Seeber, who is impressively pulling double-duty), providing their trippy take on tech death with plenty of enthusiasm. Alas, the stage was set for Cryptopsy, though oddly a portion of the crowd seemed to have vanished by this point (blame it on Monday apparently as Cryptopsy didn’t start until about 11:45). The band kicked it into high gear immediately with some newer material, including “Detritus (The One They Kept),” before diving into the classic None So Vile album. Lots of memories leading back to that album, and having viewed the band play it in its entirety with Lord Worm himself (back in 2005) it was nice to see how things change over time, yet still manage to stay the same. Lord Worm was a unique player, but vocalist Matt McGachy did a fine job with the crazed vocal sequences that album takes pleasure in. Always a pleasure to watch Flo Mounier behind the kit as well, making the challenging beats seem rather simple. Even 21 years later (! ), None So Vile sounds just as fresh as when it was released – the sign of a true classic. Hard to beat the number of fantastic bands on this bill. If you are into death metal whatsoever, this is a can’t miss tour.